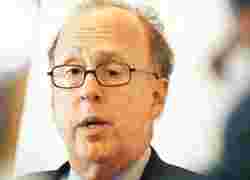 Grim outlook: Morgan Stanley Asia chairman Stephen Roach. Singapore: A US recession in 2008 is “more likely than not" as a worsening housing market curbs consumer demand, said Stephen Roach, chairman of Morgan Stanley Asia Ltd.
“If it was just a housing downturn, we might be able to squeak by without going into an actual recession, but consumers have been very housing-dependent over the last six years," Roach said on Wednesday. “With housing prices likely to decline next year, the housing-dependent consumer is in big trouble." US economists forecast declining home values, more expensive petrol and rising heating bills will leave American consumers and businesses with less cash to spend this quarter. The economy will grow at an annual rate of 1.5% from October through December, less than half the 3.9% third quarter pace, according to the median forecast of a Bloomberg survey. Economies in the region are less vulnerable to a weaker dollar and more vulnerable to US consumer demand, he added. The dollar has fallen against 15 of the 16 most actively traded currencies this year. “Asia has been reluctant to let currencies move up and the pressures on Asia will come less through the dollar correction mechanism and more through the trade flows," Roach said. While China’s economy, which exceeded 11% growth in the last three quarters, has a “huge cushion" to shield itself against a US slowdown, Japan will be less protected from the downturn, said Roach. “In a US recession, Japan loses significantly from the exports that go to the US, and it also loses from the exports of components that go to China, and get re-exported to the US," Roach said. Japan’s GDP growth may slide to between zero and 1%, Roach said, a rate which is “worrisome and near renewed recession territory". Taiwan would be “hard hit" because it ships a large quantity of components to China, and India would be “largely unscathed," he said.